Welcome to our Ischia blog, Good Morning Ischia! Here you can see the entry for Wednesday 13th November 2013. Well the weather this morning can only be described as one thing - windy! Yesterday was a gorgeous day, feeling like the middle of summer at times with warm temperatures and lots of sunshine. Today however, things have started off a bit grey and the aforementioned winds are dominating proceedings. The outlook for the rest of the day is for a mixture of sunny & cloudy spells and maybe a few drops of rain this evening or late afternoon. Temperatures today should be back up to a maximum of 21° celcius (70° fahrenheit) and a minimum of about 17°C (62°F) for tonight. Today's photo is of the Toledo Metro station in Naples on the mainland. Most people that visit Ischia will pass through Napoli and take a ferry or a hydrofoil from the ports of Porta di Massa and Beverello. This incredible city is just an hour away from Ischia (by hydrofoil, about an hour and a half by ferry) and is the most important city in southern Italy. It is the capital city of the region of Campania and has a population of just under one million in the main city area, with about 4 million in total when you include the suburbs. Naples is a fascinating city of contrasts with a mixture of ancient buildings and a modern business centre, but the most striking thing about the city is its people. Neopolitans are known for their zest for life and as you walk around the city's winding streets there's a permanent buzz of things happening around you from street sellers to the busy roads and the animated, frenzied conversations in the cafes, bars and restaurants. When people speak about Naples another subject that is never far from the lips (in more ways than one), is pizza! Naples is the home of pizza and the benchmark of quality for every pizzeria from Rome to New York. Somehow, the pizzas in Naples just taste that little bit better than they do everywhere else as its "Pizzaioli" (pizza-makers) adhere to centuries of tradition and culture to make sure the dough is blended in just the right way and then placed in the oven at just the right time. What is not so well known about Naples is that it has a fabulous set of new underground metro railway stations. In the picture above is one of Naples' "art stations", Toledo. This particular station was opened in 2012 and was recently named as the world's most beautiful metro station by the Daily Telegraph and there are several others that regularly appear near the top of similar lists such as the art-stations of "Universita'", "Dante" and "Museo". 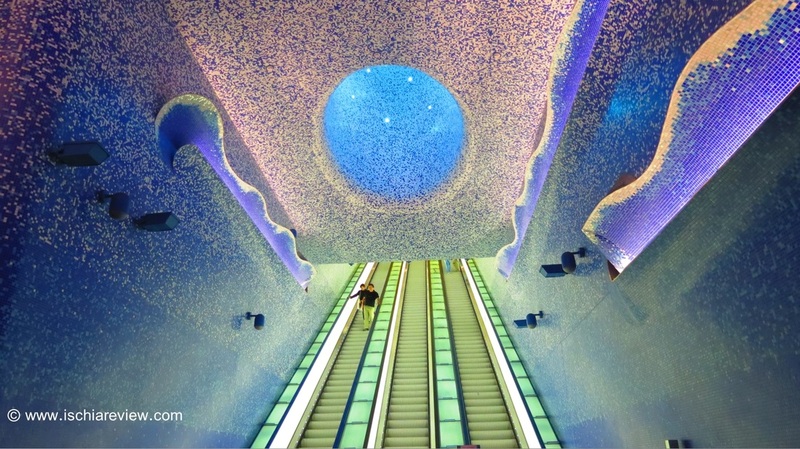 For anyone who is planning on spending a bit of time in Naples I would definitely recommend checking out some of these Metro stations and there is also the "Metro Art Tour" which starts at Toledo station and takes in the other dozen or so art stations. Ok that's all from me today, on the day that the world wide web first started in 1990, I wish you all a good day and if you're somewhere in Naples today, definitely try the pizza, you won't be disappointed!